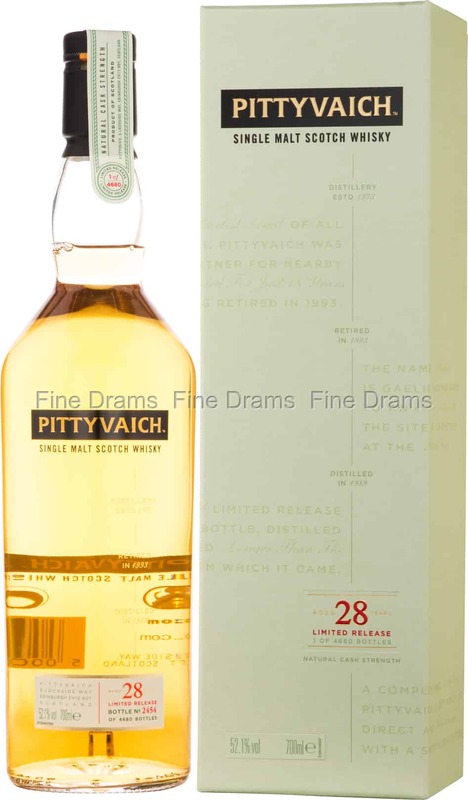 An extremely rare entry in the 2018 Diageo Special Releases – Pittyvaich was closed back in 1993m and bottles are not often seen. This 1989 vintage offers drinkers a rare chance to try this whisky, at a superb age. Pittyvaich is in an almost unique position in that its first official bottling only arrived after the distillery was closed. Originally the distillery was built to provide Bell’s blend with malt, and as such the spirit made at Pittyvaich is quite biscuity and malt-rich. Such is the case with this whisky, a richly malty and cereal-driven whisky, which has picked up a good deal of oak influence from the long maturation. This Pittyvaich was matured in refill American-oak hogsheads. Drinkers can expect notes of toasty barley, apples, old oak, green grapes, marzipan, toasted coconut, flowers, ginger, cinnamon and pastry. Bottled at a robust cask strength of 52.1% ABV, this is a powerful and delicious dram.